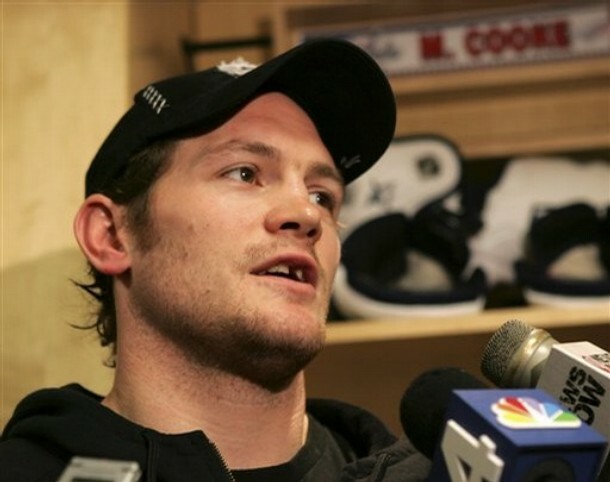 Matt Cooke's "Greatest Hits" would go double platinum. The Pittsburgh Penguins winger has been in the news the past couple of years ever since his hit on Boston Bruins forward Marc Savard that essentially necessitated a rule on headshots. Cooke has been at it again with a hit on Alexander Ovechkin, but the Savard incident was certainly not the first he's had. In fact, Cooke was a long time Vancouver Canuck as most will remember. During his time in Vancouver he was a fan favourite for some time and even scored some very memorable goals for the team (including two memorable playoff goals in the dying seconds against Minnesota and Calgary), but towards the end of his stay, Canucks fans and the team became tired of defending his questionable hits and constant turtle routine. Recently, Cooke caught Capitals' star forward Alexander Ovechkin with a knee on knee hit that caught the eye of Washington's head coach Bruce Boudreau. Cooke "knows damn well what he did," Boudreau said. "There's no doubt in my mind that he's good at it and he knows how to do it. He knows how to pick this stuff. We as a league, we still buy into this [idea] that, 'Oh it was an accidental thing.'" Ovechkin is not an innocent party, as he's had his share of knee on knee hits (just ask Sergei Gonchar or Tim Gleason), and hits from behind (just ask Brian Campbell, or Danny Briere) but PuckWatch has taken the liberty of compiling Matt Cooke's "Greatest Hits". Judge for yourself whether Bruce Boudreau is correct, or if Matt Cooke is just a hard-nosed player. Certainly if you hit opponents as often as Cooke does, you're going to be caught in some bad situations on occasion, but there does appear to be some history. As if that wasn't enough of an indictment, how about the first game Matt Cooke played against his former team, the Vancouver Canucks? Cooke tried to take out Alexander Edler with a questionable hit that raised the ire of the rest of the Canucks. Inciting a line brawl against your former teammates within half a shift? I'm sure they respected you a great deal. Would not be surprising if Cooke's former teammates felt like he was your little friend at a bar who would pick a fight with the biggest guy in the room, leaving you to defend him. In fact, during Cooke's 12 year tenure in the NHL, he averages just over one fight per year. That number may not stand out to you, but consider the toughness (or lack thereof) of his opponents as listed by HockeyFights.com: Trevor Daley, David Hale, Evander Kane, Ladislav Kohn, Jannik Hansen, Alex Korolyuk, Jamie Langenbrunner, Ryan Malone, Steve Moore, Ronald Petrovicky, etc. It's also important to consider how many times he was a willing combatant as well. Cooke has been accused of biting Aaron Asham of the Philadelphia Flyers, and ignited a nasty rivalry between the Minnesota Wild and Vancouver Canucks years back for his altercations (spear) with Matt Johnson, among others. At his best, Cooke is a distracting agitator that gets under the skin of the opposition, but at some point, you'd figure he'd consider his reputation and legacy - as it is apparent that there are not many people out there who respect him. For those of you who would like to see Cooke get a taste of his own medicine, shame on you, no one should wish injury upon another person. However, if you'd like to see the Cooke pick on an 18 year old kid and get the surprise of his life, well, here's some Evander-Therapy.